You’re a multifaceted individual with a busy schedule. Which means you need a vehicle that can keep up with your fast-paced lifestyle. You require an SUV that’s equally at home among the concrete tangle of city streets, the wide-open stretches of highway, and the sometimes challenging terrain of the roads less traveled. 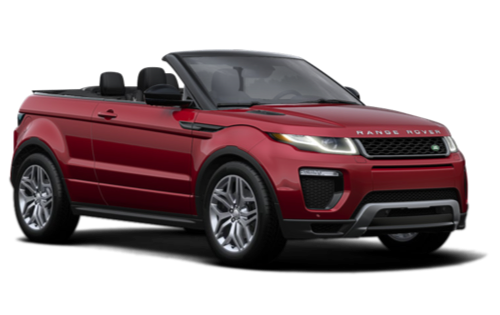 The Range Rover Evoque is a compact SUV that has everything you’re looking for, and will allow you to discover that big things really do come in compact packages. If you’re looking for a Range Rover Evoque near Markham, visit the dealership that’s dedicated to you. Welcome to Land Rover Toronto. At Land Rover Toronto, we’re proud to maintain a comprehensive lineup of Evoque models, each equipped to take your everyday adventures from ordinary to extraordinary. Our expert sales team will help match you with the Evoque that checks off all the boxes on your must-have list. And with fabulous dealership perks such as complimentary valet parking, 5 on-site cafes, and at-home test drives, it’s no wonder we’re the premier dealership for Range Rover Evoque models near Markham. Visit us at 777 Dundas Street E in Toronto, ON, or feel free to give us a call at 416-530-1880. Your next adventure awaits. Enjoy complimentary valet parking when you visit Land Rover Toronto. We always strive to provide a dealership experience that goes beyond your expectations. Visit us near Markham today! Put your Range Rover Evoque through its paces with an at-home test drive. What weather? In the Range Rover Evoque, challenging driving conditions are nothing more than a chance to excel. The Evoque was engineered to explore, thanks to a suite of intelligent technology designed to give you greater precision and control than ever before. Terrain Response lets you choose from a variety of driving modes such as Grass, Gravel and Snow, Mud and Ruts, and Sand to ensure your Evoque is optimized for every driving condition. Take your adventures farther than you ever thought possible, in the Range Rover Evoque. The Range Rover Evoque incorporates convenient touches from bumper to bumper, each designed to enhance your experience. Traffic Sign Recognition displays road signs right in the instrument cluster, which keeps you fully informed and lets you respond more quickly. State of the art heating and cooling systems ensure that you and your passengers will always be at the optimal temperature for comfort. InControl Apps lets you seamlessly integrate your smartphone, which helps keep you connected no matter where you roam. Experience the future of driving today in the Range Rover Evoque. Of course, the Range Rover Evoque is best known for its capability and luxury. However, the bold road presence and dynamic, sculpted lines can’t help but garner second glances. The evocative design speaks to the hours of engineering, thought, innovation, and craftsmanship that go into every Evoque model, and inspires confidence at first look. Don’t just turn heads. Cause people to stop and stare in the Range Rover Evoque! Find yours at Land Rover Toronto, and get ready to hit the road in style. The Range Rover Evoque may be a compact SUV, but it scores big when it comes to delivering smart safety. In the Evoque, a host of intelligent systems work together to help stop an accident in its tracks. Blind Spot Monitoring guards your flank by warning you of approaching vehicles, while a variety of integrated parking technologies helps take the stress out of parking in that perfect spot. Add to this the robust engineering that comes with testing the Evoque beyond the boundaries of the road, and you’ve got an SUV that delivers superior protection for you and your passengers. Are you looking for a vehicle that will allow you to explore the entirety of this big, beautiful country in luxury and style? Land Rover vehicles combine the best of refinement, exceptional craftsmanship, and go-anywhere performance. To find yours, visit Land Rover Toronto. We’re proud to bring these incredible vehicles to drivers who crave the thrill of exploration. As part of the Grand Touring Automobiles Group of Companies, you can depend on receiving the kind of personalized, world-class service that befits this amazing brand. When you choose Land Rover Toronto, you’ll enjoy fantastic perks like valet parking, at-home test drives, and a well-appointed dealership that includes five cafes, in addition to our breathtaking lineup of adventure-ready Land Rovers. Visit our dealership at 777 Dundas Street E in Toronto, ON, or feel free to give us a call at 416-530-1880. The open road awaits. Find what drives you at Land Rover Toronto. After a not very pleasant experience, Alec and Raaj made sure our purchase and experience there was excellent. Alec is one of the most knowledgeable people not only regarding land rover but all the brands and his information and knowledge helped us choosing the right car. We definitely recommend this dealership specially Alec if you're looking to purchase a car. Thank you Raaj and Alec for making our purchase so smooth and great.